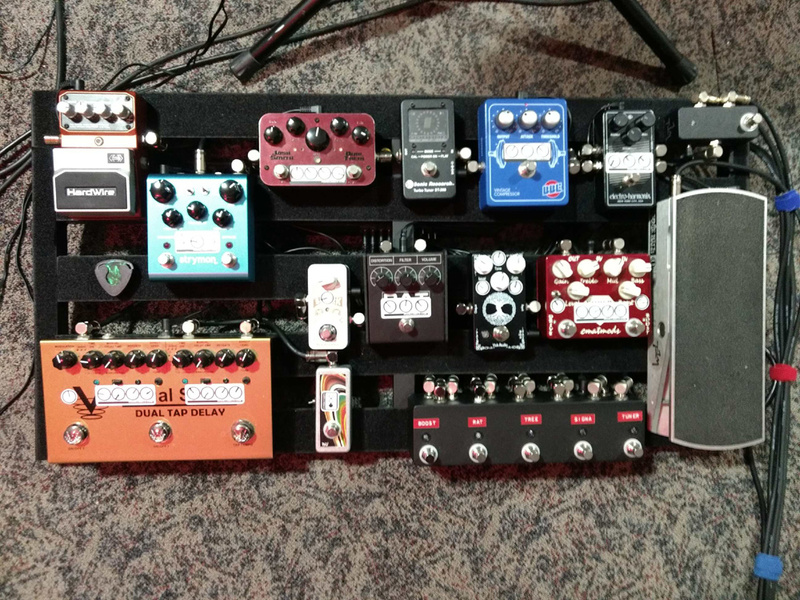 Today’s Pedal Line Friday submission is from Bruce Arensmeyer. If you have a pedal line (doesn’t have to be in a board) for your rig, please email me a photo, bio, description of pedals and routing to pedalline@nulleffectsbay.com. Every Friday I’ll showcase a pedal line submission. Make sure you include any links to your band or music page. Hi all, Unable to be content with my last board, I figured an updated board and power supply was in order. 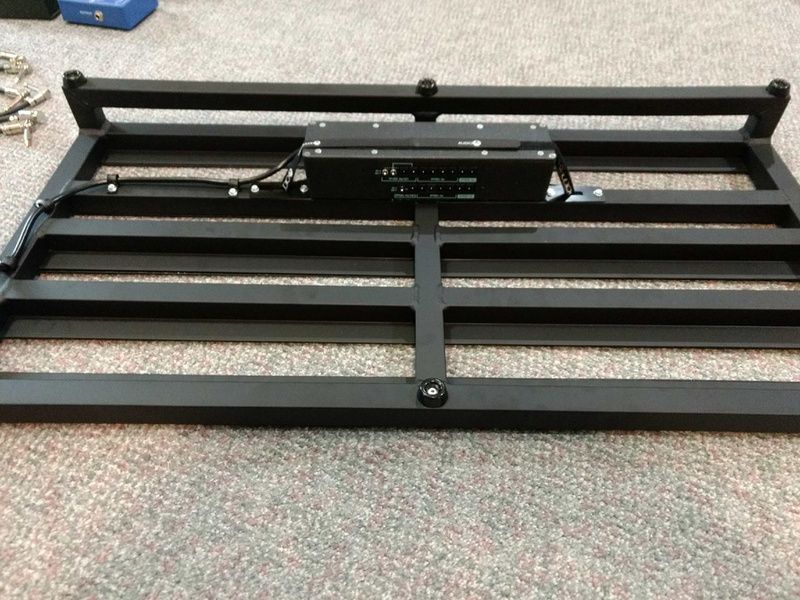 The board is a Pedaltrain Classic Pro with a Walrus Audio Phoenix power supply mounted underneath. 14 pedals to power and this one covers them all with one to spare! Took a bit of velcro and drilling to mount it where I did, but it frees up the space underneath for cables. Looks and works great but be aware that you have to elevate the board a half inch to keep the supply off the floor. I just used the round felt chair spacers from Walmart to bring it up to height. Runs into a Rivera Venus Deux Head and cab with Altec 417-H speaker from the 70’s. Sounds absolutely fantastic and wish I had done this sooner. 1. T1M A/B Switch with buffer: To switch between two guitars and push the signal through. Tim does great work but you may have to wait for it! 2. Electro Harmonix Silencer: Takes any noise from guitars and my stacked overdrives or that Rat! 3. BBE Bench Press Compressor: An old Ross style compressor I really like. Own 2 and can’t believe they are not more popular although prices have really been going up on them. 4. Trinity Pedals 5 way Looper Switcher with Klon style buffer. Nice pedal and the buffer really makes a difference. The following pedals are in the looper. 5a. Sonic Research ST-200 Tuner: This is a really accurate and quick tuner. Love it! 5b..CMATMods Super Signa Drive: My light overdrive. Keep the boost on to brighten the sound and it’s an excellent pedal. 5c. Vick Audio Tree of Life: My medium to high gain Overdrive. Nothing better in my opinion for that purpose. 5d. Original 1988 RAT: My first pedal that still kicks it for distortion or searing leads. Would kill if stolen! 5e. TC Electronics Mini Boost: Nice small pedal with zero tone change. Just a great clean boost. 6. Back into the Silencer and then to Volume Pedal. 8. Rockett Pedals Josh Smith Dual Trem: Another great pedal from Rockett and I believe they quit making them. Pricey but well worth it to get 2 trems in one. Use one side for rhythm and the other for leads! Would recommend picking one up before they are gone and the prices goes through the roof. 9. Visual Sound Dual Delay: Really like the sounds I get and use Dotted Eights on the modulation side primarily. Have triplets set up on side two for thicker leads. Use quite often. 10. Strymon Blue Sky Reverb: Nothing better for that awesome reverb when you need it. Use the shimmer sparingly for keyboard sounds every so often. 11. Digitech Hardwire Delay DL-8: Use for some delay after everything for some weird sounds. Mostly use it for the looper. Good pedal.Out to Effects Loop: I have been using the Pedal Labels for several years and they are cheap to buy, but a life saver for those of us with big feet. Never worry about settings being off after a move.